While Rockefeller Center is known for its towering sights—namely the world-famous Christmas Tree—you don't expect to turn the corner in the springtime to see a 45-foot ballerina gracing the Plaza. But that's the magic awaiting visitors for the next few weeks, courtesy of artist Jeff Koons. Koons has previously created two other public sculptures for Rockefeller Center, "Puppy" in 2000 and "Split-Rocker" in 2014. Now his third, called "Seated Ballerina," departs from the topiary-influenced medium of the previous two, being made of inflatable, reflective nylon. The figure, a blond dancer in a light blue tutu who is adjusting one of her ballet shoes, is based on a stainless-steel sculpture that Koons designed as part of his "Antiquity" series, which in turn was modeled on a porcelain figurine. Translating the character from miniature to monumental accounts for some of the fairy-dust aura, as she's both doll-like and giant, a sweeping vision whether you're facing her from the Channel Gardens or seeing her in profile. The sculpture is simple with playful shapes and colors, and the eye-catching effect of light bouncing off the fall of a ponytail, the curve of an elbow or the ripples of a tutu in the precisely engineered fabric. The installation also carries a larger message, as it's designed to bring attention to National Missing Children's Month and to help support the International Centre for Missing & Exploited Children. Koons partnered on the project with Art Production Fund and Kiehl's, who will be donating proceeds from a limited-edition "Seated Ballerina" tin to ICMEC. "It communicates optimism," Koons told us on the sunny Friday the sculpture opened to the public, as passersby stopped to gaze, pose and join in the spectacle. The piece says that "we all have potential, we can all live to our potential and expand our parameters, especially our children. And we can help them fulfill their desires," he says. For Koons, it's important that the work is "completely accessible" to everyone. Presenting his art at Rockefeller Center for the third time, he says, "On each occasion it's always been so exciting just to be engaged with the community, all the people that are flowing through here, and there are several hundred thousand a day that come through Rockefeller Center...You know, this is a symbol of the center of the world for me, and the Christmas Tree—the idea that events take place that we hold as a kind of ritual, to a certain degree. So it's very meaningful." 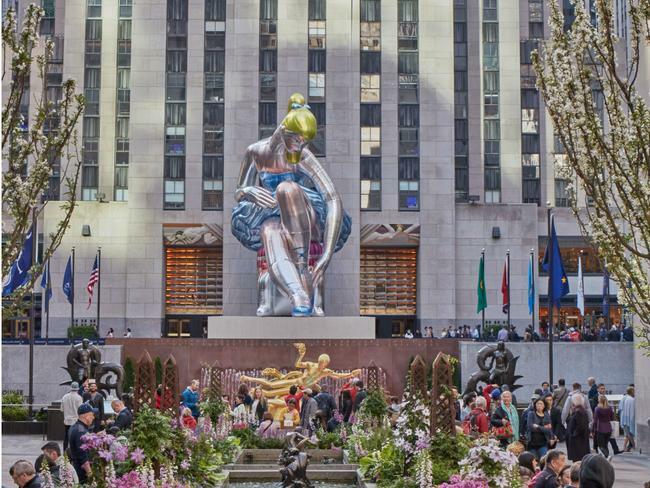 Koons finds that "Seated Ballerina" and the buildings of Rockefeller Center, with their continuous limestone surfaces, "complement each other well," creating a "beautiful harmony." At the same time, having reinterpreted a rigid metal form to become an enormous inflated sculpture in a public space, he says the figure now "has slightly more of a shocking quality to it. It's more of a surprise." "Seated Ballerina" is on view through June 2 at Rockefeller Plaza, between 49th and 50th Streets and Fifth and Sixth Avenues. It will be deflated for safety reasons during inclement weather, so please check Rock Center's Twitter feed. Update: The installation has been extended, and will now be on display through July 5.